The count down is on to the last few weeks in school and that means summer is almost here! 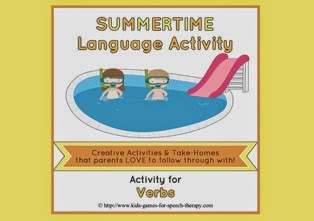 If you are looking for a summer themed activity for teaching verbs in SVO sentences (can also be used as a barrier game for following directions), then today's freebie is perfect for you. If you are planning summer homework programs then this is a must as the parent instruction sheets are pre-written for you to just print and go! I hope there is some summer weather on the way wherever you are. I'm ready for some sunshine! You can download your copy in my TPT store by clicking here.